A book by Sharon Munro. For nearly a year Sharyn Munro travelled through rural Australia, visiting the communities in the coal-mining areas. She found a war zone. Here, ‘at the coalface’, towns and districts are dying — homeowners and farmers forced out by mining, broken in spirit and in health, or else under threat, in limbo and battling the might of the multinationals. Incidences of asthma, cancers and heart attacks show alarming spikes in communities close to coal mines and coal power stations, yet the government seems powerless (or unwilling) to act. Once reliable rivers and aquifers are drying up or become polluted, once fertile agricultural land is becoming unusable. But the big mostly foreign-owned mining companies continue to push on with their coal rush and government continues to assist and protect them: ever more mining licences are granted, ever bigger mines are opened. 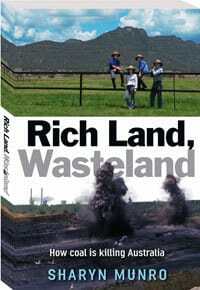 Sharyn exposes the real story of coal in her lifechanging new book, Rich Land, Wasteland, presenting an impassioned account of the human price individuals and communities are paying for the coal rush. “I wrote this book to share with Australians what I experienced and learnt. Most Australians, I believe, are decent people who would be appalled by what is going on if they knew,” said Sharyn Munro. Sharyn Munro is a freelance writer, who lives in a solar-powered mud brick cabin on her mountain wildlife refuge in the New South Wales Hunter Valley. Her first book, The Woman on the Mountain, was released by Exisle in 2007, and her second book, Mountain Tails, in mid-2009. To order a copy go to: http://richlandwasteland.com OR contact the CAFNEC office on 07 4032 1746.